As part of a visual book assignment, Conservation Librarian Peter Verheyen presented my 2-D Problem-Solving class with an informative discussion of artists' books. 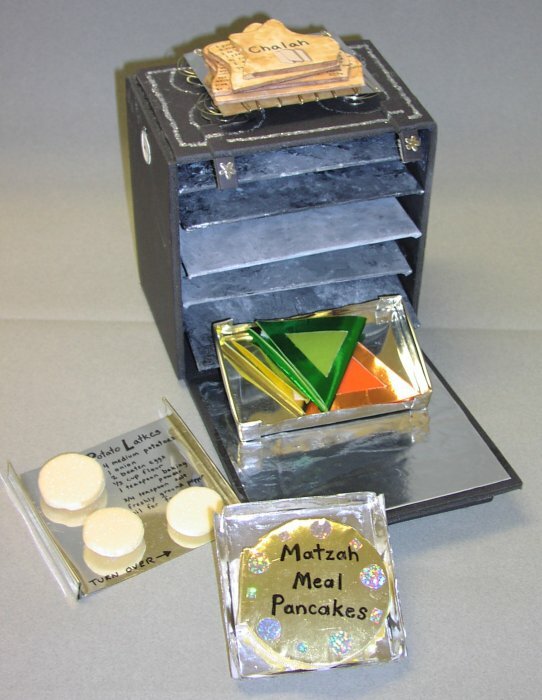 He showed the class a variety of book structures, binding techniques, slides of contemporary book arts, and pointed out the connection between structure and content. Rare Book Librarian Ken Lavender treated the class to a presentation of the history of the book on the following week. Ken showed them many examples of different book structures: clay tablets, scrolls, illuminated manuscripts, interactive books and artists' books and discussed paper and printing techniques. Both these presentations provided the students a valuable background for the ensuing assignment. Back in the classroom, the students were asked to do a twenty-minute free write on one of three topics Time, Identity and Journey. This became the basis for their visual book. They could use any material that related to their idea, with the structure being an integral part of their concept. The students met in small groups for two brainstorming and idea-exchanging sessions and presented their books on the third week to the entire class. During the work process, Peter was available to help the students with their technical problems and was instrumental in organizing this show. The descriptions are in the students' own words. The exhibition will remain on display in the Reading Room of the Special Collections Research Center, 6th Floor, E.S. Bird Library, through the end of April. Hours are from 9 - 5, Monday - Friday. This book shows the transition of the magician making the rabbit disappear and then reappear. I used a deck of cards, alternating the black and red suits. This is a fun and unique book. This book tells a story of a little girl being granted her 3 life lessons. The fortune cookies hold an important message in them. The structure of the box incorporates the story and the illustrations on the other side. This is a very interactive book. 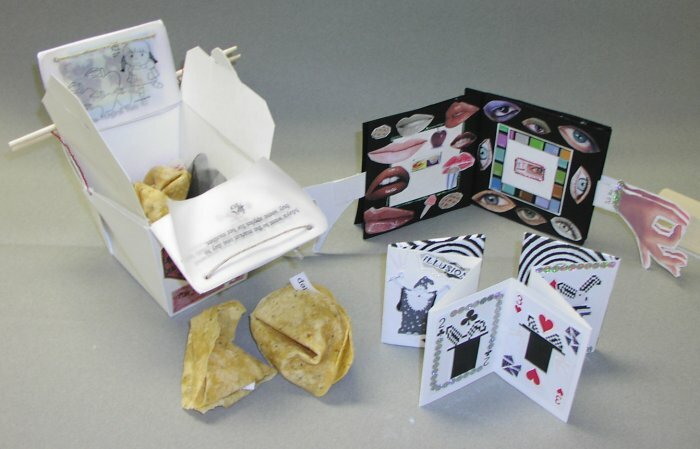 This is a pullout book of the five senses. Each page has one of the five senses with descriptions of sight (eyes), touch (cotton balls, nail file), taste ( food), sound (noises), and smell (perfume). This is a unique and innovative interactive book. I made an interactive book about the four seasons. 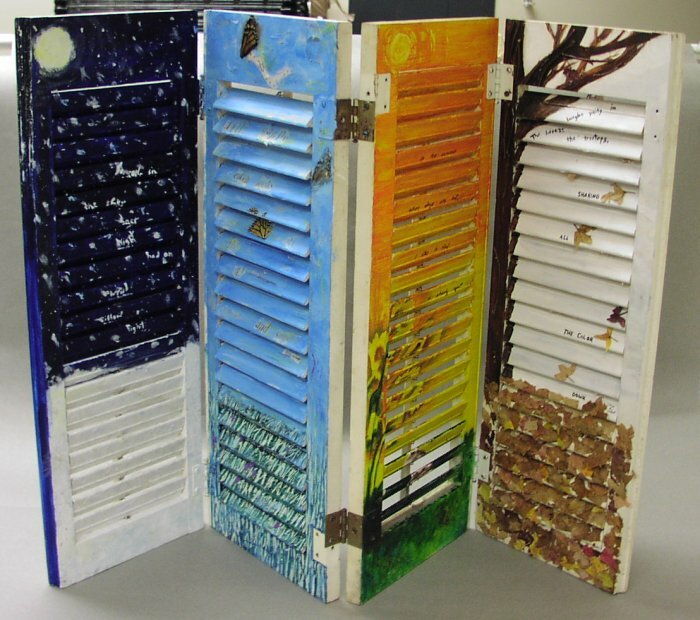 I found some old shutters to use as the book structure. You flip the shutters up and down to read the poem that corresponds with that season while watching each season take place. On the winter shutter you can see the snow falling, in spring the butterflies fly, summer is pretty lazy and doesn't do much, and in the fall you can watch the leaves fall from the tree. This book represents someone watching the seasons pass by when looking out a window through shutters. This book is not supposed to resemble a book on the outside and neither is the viewer supposed to feel as though they are reading a book. 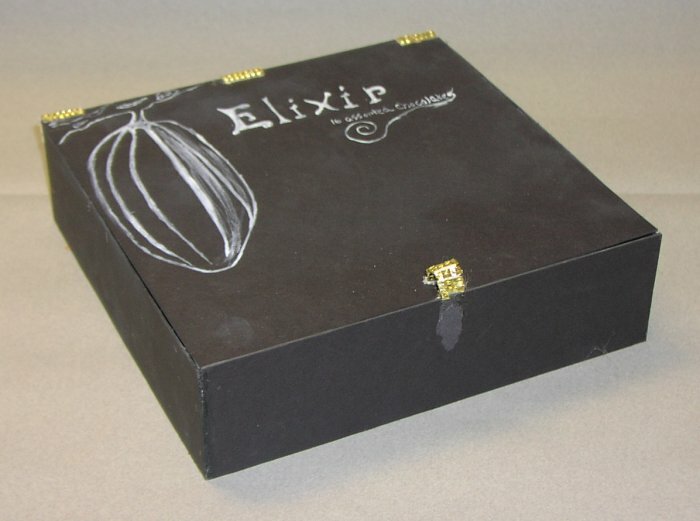 The outside of the book resembles a chocolate box called Elixir with the outline of the cocoa bean painted on it. 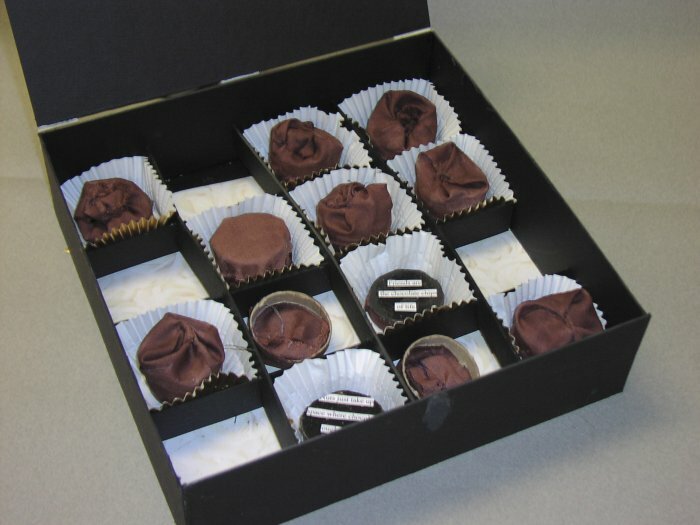 Untying the satin ribbon and opening the box you see what appears to be edible looking chocolates, but they are actually made of cloth, which has been coated with fabric stiffener and cut up toilet paper tubes. Each chocolate has a removable top which reveals an inside message pertaining to the love of chocolate and a few interesting facts about chocolates. The book is based upon The Chronicles of Narnia. My book is based on an idea mentioned in the first book, The Lion, the Witch, and the Wardrobe. Tumnus the fawn had in his library a book entitled, Is Man a Myth? 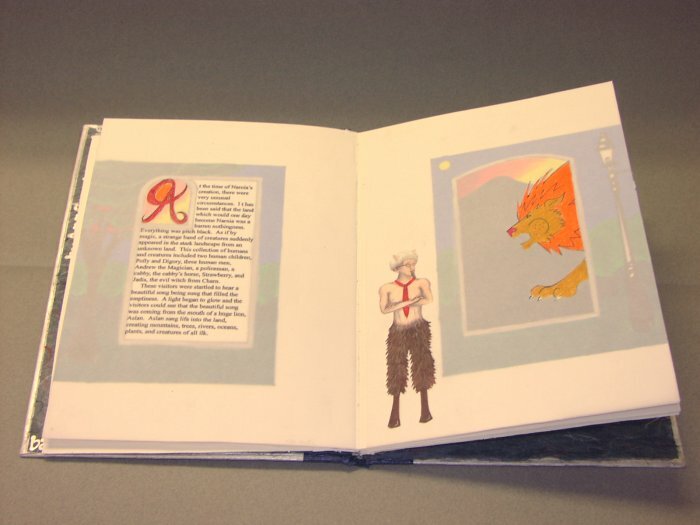 Borrowing from this idea, the book's intention is to represent how a Narnian would tell the story of their own history. The Beltway Sniper portrays the hysteria and mystery surrounding the frightening serial killing spree that occurred in Washington, D.C. Beltway area last October. 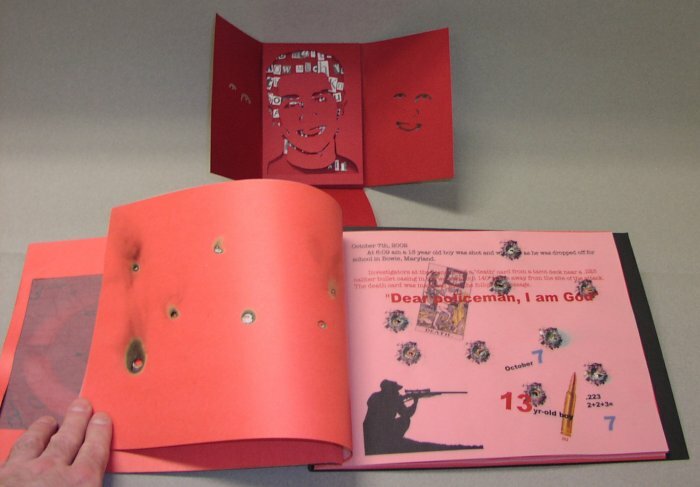 This book is based on the elements of design and structure and utilizes stenciling to explore a deeper look into the conditions of human relationships. In 1831 my fourth great-grandfather, Robert Mooney and his small family began a long, overseas journey from their homeland in Coothill, Ireland to Prince Edward Island, Canada. Being subjected to the harsh British landlords, and a potato famine that had lasted for almost ten years, Robert moved his family with hope for new opportunities for the Irish people. 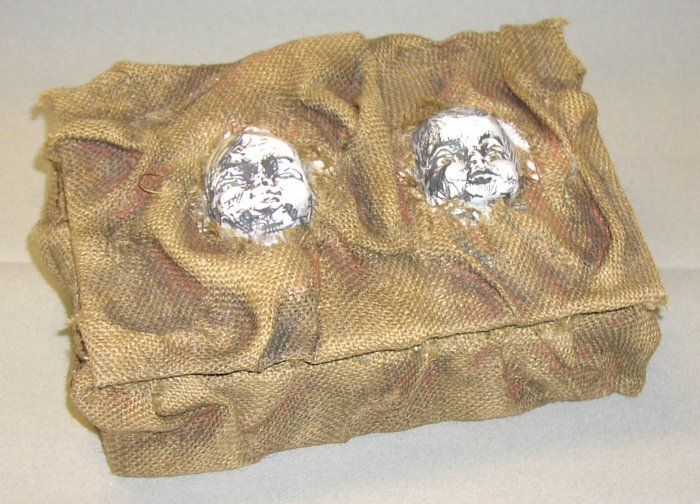 They began their journey overseas on a ship named the Morgianna. On Prince Edward Island they became potato farmers and my book is symbolic of this, by its worn potato sac burlap encapsulating the interior diary entries. The corpse-like images that protrude from its cover symbolize many relatives who died during the famine in Europe, and unfortunately never made it to Prince Edward Island. Although many of these relatives I will never know, their legacies and experiences live on with many of the diary entries that I have recreated on handmade paper. Each entry was written by Roberts wife, and is sandwiched between actual potato cut prints on rice paper. My book is based on reflection, and shows me writing to different people saying something that I wish could have changed or done better. 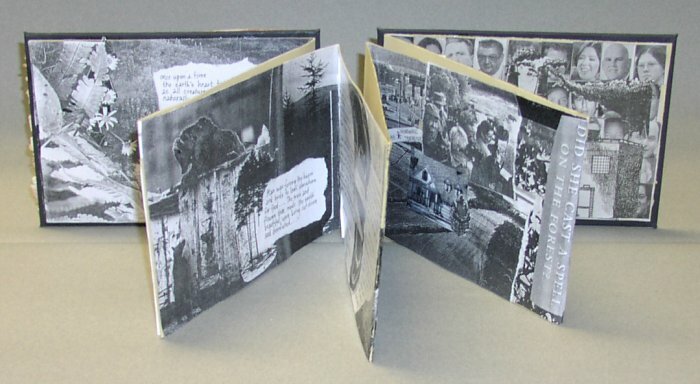 After each page is a reflective glass plate showing images related to the writing. 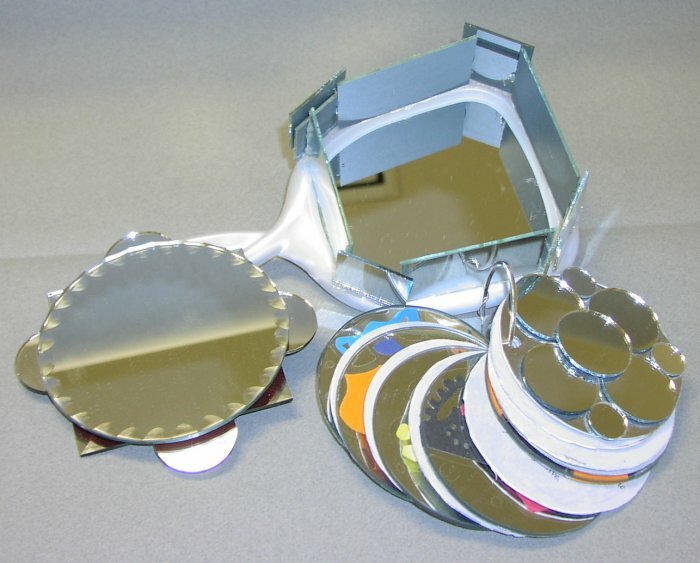 The book is in a box that is shaped like a hand mirror and is also reflective. This book is about love. 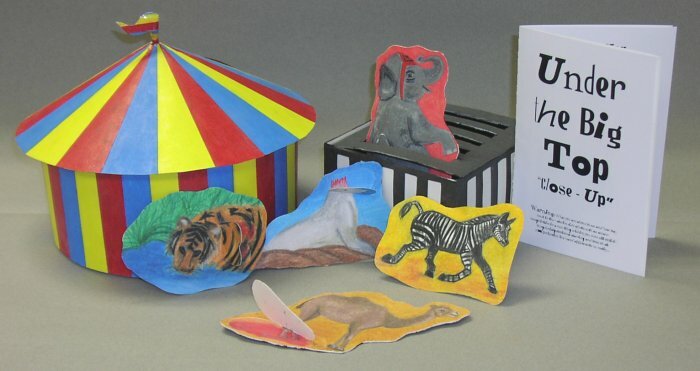 It is inside of a hatbox that is covered with paper that I made. The book tells of what love is, my journey with it and that special someone who has let me enjoy love. I really opened up in this book, much further than I usually do, and I would really like others to see it. 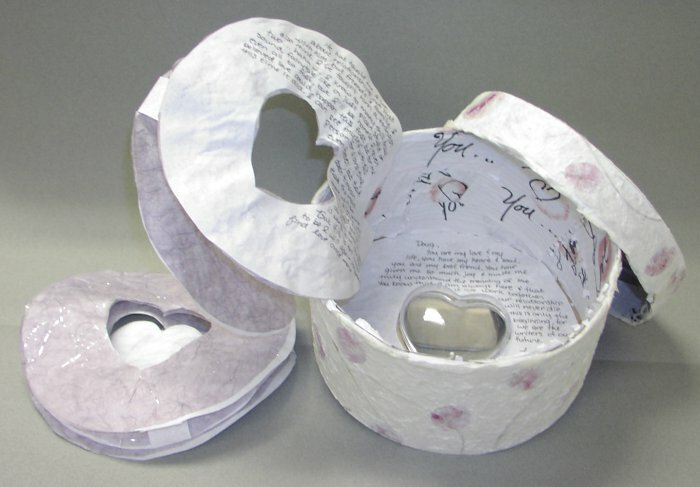 The pages go in a circular movement and there is a clear heart cut out in the bottom to symbolize that love is never-ending and forever changing and that there is no one thing that defines love. 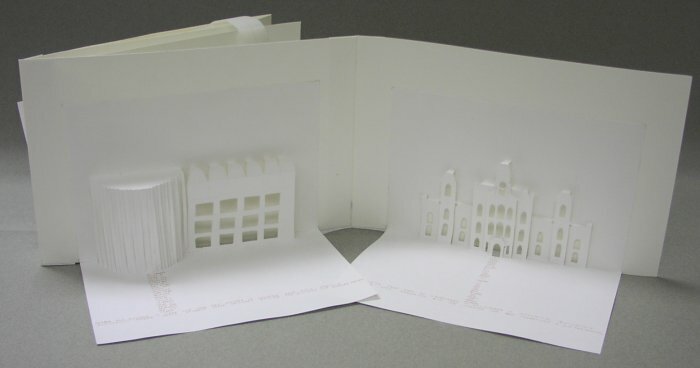 This pop-up book consists of five Bristol panels each illustrating a building in Syracuse. Mylar was used in the back to allow light through and create shadows and depth in the cutouts. The text is my thoughts and first impressions of each building, written in a fashion so it makes a pathway to the buildings. It also acts as a connection from panel to panel. With this book I am approaching the issue of my fathers divorce from my mother and remarriage to another woman. I am originally from England and when something upsets someone over there they are not supposed to say anything about it. Therefore I spent a great deal of my childhood brushing things off and pushing emotions deep down and simply saying that everything is fine. The band aid on my heart is from a funny saying that you heal a broken heart with a band aid and even though it is on there, it doesnt truly work at healing the wound. This book is about my anorexia and my insecurities. 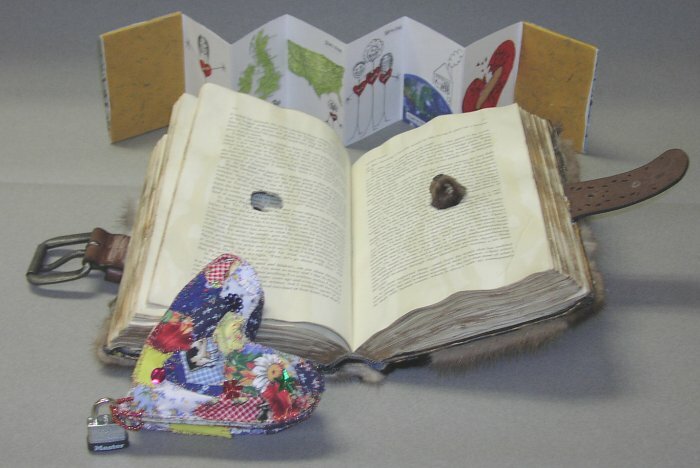 The book is shaped like a heart because of the saying cross my heart and hope to die. To illustrate this point, sentences are attached to strips of fabric inside the book structure that alternately cross over each other as you read. On one side I have my secret thoughts about my weight and my issues with how I look. The other side is fun facts about me that not many people know about. 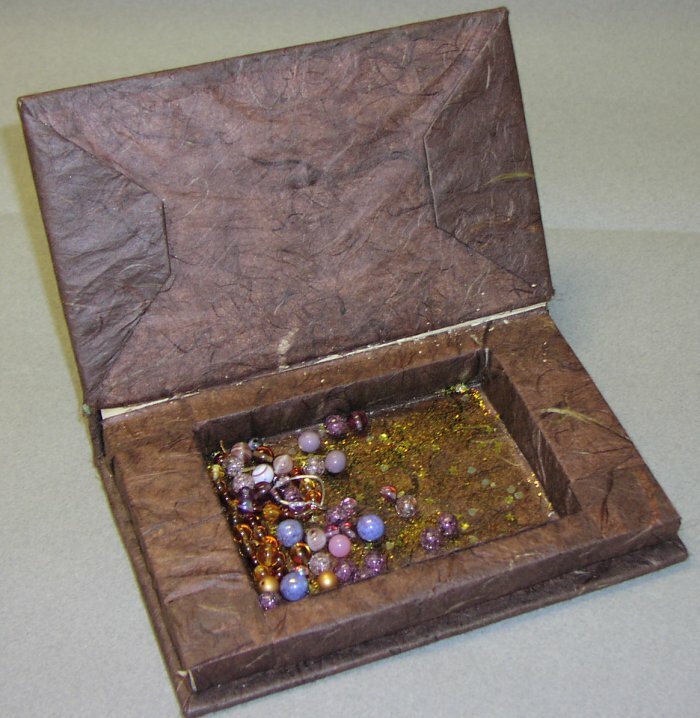 The book is made out of a constructed copper wire frame and quilted with childhood fabrics that I still own such as pajamas and clothes that I wore as a child. I completed this book over Christmas when my mom bought home a mink head from the fur store where she was working. The title of the book is Conversations and it is so interesting the way you open the book and discover the small nose and then the face that seems to be talking to you. I covered the book in fur, tinted the edges gold and stained the paper with coffee to make the book appear as though it had been around for hundreds of years. Swarm begins as the story of a bee, but ends as the story of the human worker. The bee emerges from the confines of its first enclosed space in the hive, only to become the prisoner of a cubicle. This juxtaposition was one that I was feeling during the winter-emerge from my cramped concrete cube of a room, only to land in another cage of walls. When 'closed this book is a black cube. After the first splitting, it shows the earth flanked by a sunrise and a landscape of mountains. From there, each piece folds out again, revealing the slow degradation of nature through a hydrogen bomb explosion, nuclear waste facilities, a graveyard, a depiction of a thalidomide baby, a toxic factory and a mutated frog. Upon the last unfolding of the cube, it has become 8 individual cubes, each depicting a different part of the cycle of human development. The cubes encircle the earth, now in a mixed state-- new growth comes now from death, and an earth conscious mind emerges in the wasteland, which we have created. I wanted to create a chronological documentation of the gradual degradation of the earth due to humanity's waste and abuse. I created an accordion book out of Rives BFK paper and cardboard, as well as black and white photocopies of photographs from National Geographic. 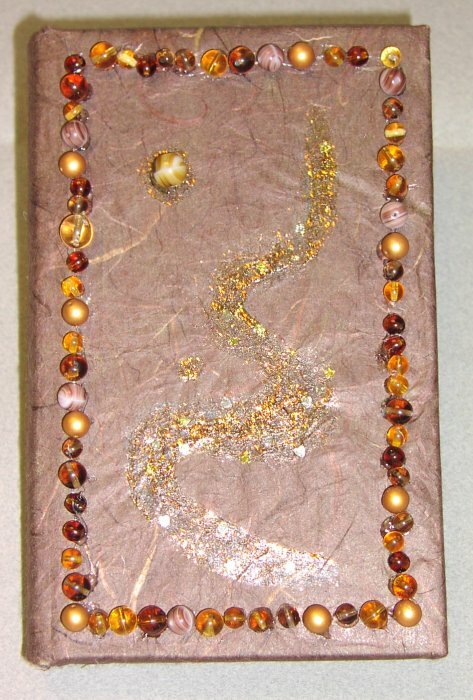 The cover of the book is swathed with strips of birch bark. The title, "Decoquo" is a Latin word meaning, "to ruin oneself". I wanted to personify the earth as a living and feeling being; and humanity as a collective entity ruining itself by overusing and exploiting the earth's resources. Earth begins its life as a natural and harmonious life form and is eventually eradicated by civilization. This book is its testament. 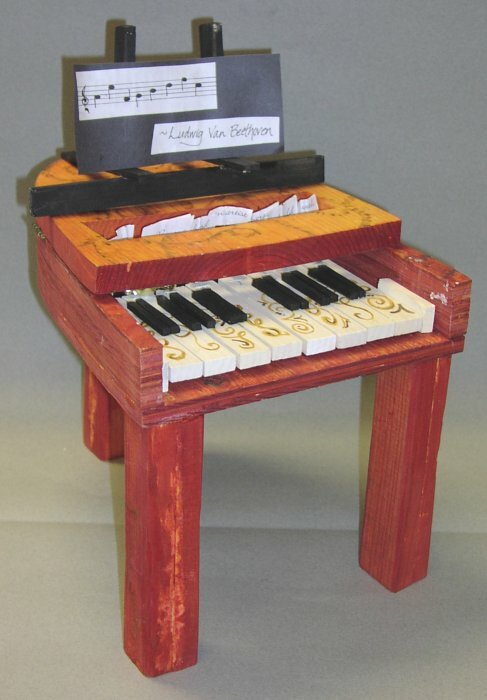 My book is made of wood and is in the form of a small piano. When you hit the keys on the piano they jingle from the bells that are attached and words will pop up out of long space on the cover of the piano. There is also a small stand with sheet music. If you follow the notes on the sheet music then the words inside the piano will pop up in order of a saying once quoted by Ludwig Van Beethoven. My book is based on my own life-altering experience in the hospital. I used varying block printing techniques to create the haunting imagery that remains with me long after my visit. 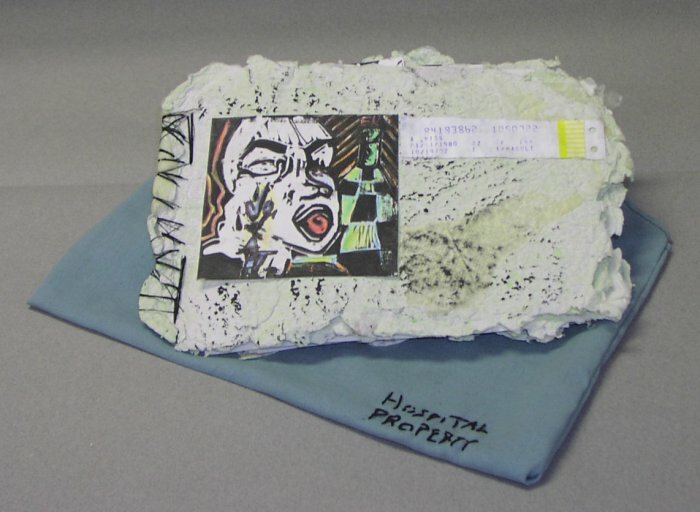 I hand made the paper out of hospital robes and green pulp to simulate the eerie environment of the hospital. 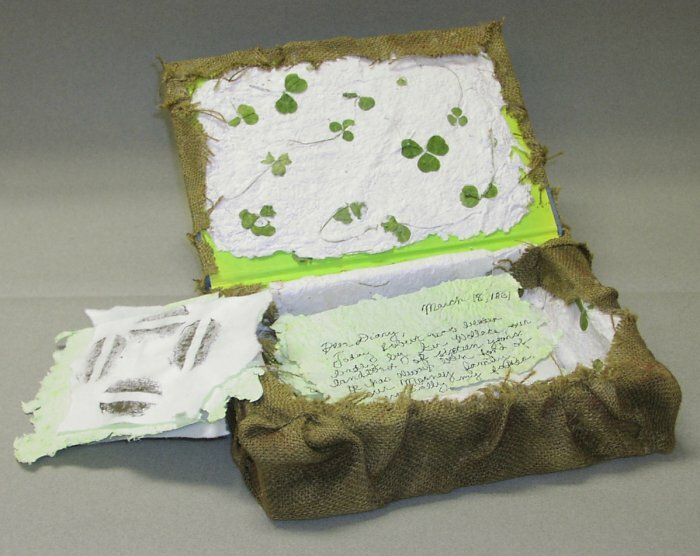 The book is bound with black thread and the stitches resemble those given to a patient. There is no written story line, only the images with hidden words to be found in them that are also stitched into the paper. The book was made for myself and the abstract view is how I view my disillusioned and unconscious experience in the hospital.